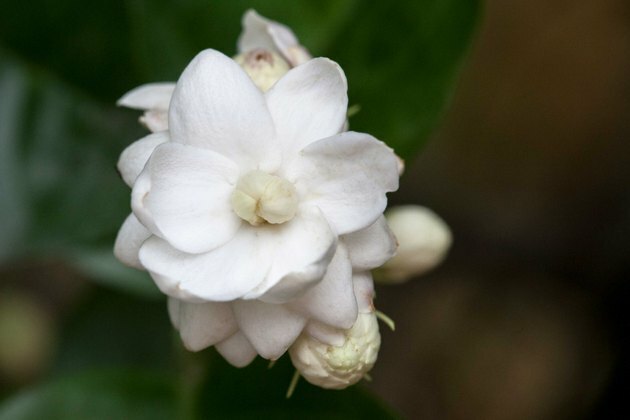 Jasmine is a climbing flower with a distinct scent that is often captured in teas and perfumes. Jasmine plants can be categorized into summer jasmine, which grows in warm sunny locations, and winter jasmine, which enjoys the shade. Both types of jasmine should be pruned after they bloom--in late summer for summer jasmine and early spring for winter jasmine. Your jasmine will also benefit from maintenance pruning to prevent its stems from becoming overcrowded and unruly. Remove the tips of each stem once the flowers are gone using sharp gardening shears. Cut the stems at an angle, so water does not collect on the cut's surface. 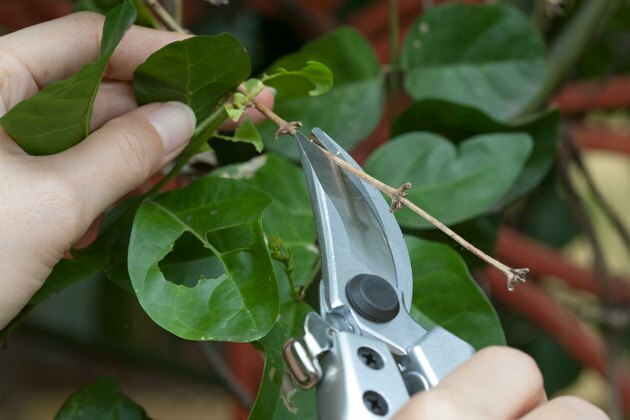 Remove weak or damaged stems right after you tip prune your jasmine. Stems that are crossing, bent or overcrowded should be clipped at the base and removed from the garden. 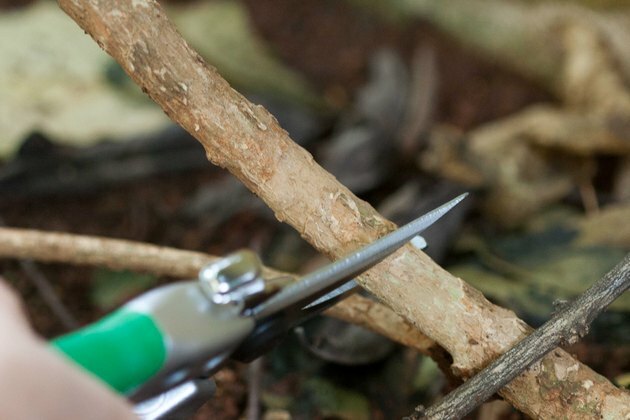 Cut back any stems that are growing on other plants or in undesirable directions. Jasmine is a climbing plant, and it will grow over other plants and objects in your garden if you allow it to. If you don't want neighboring plants or objects to be swallowed by your jasmine, remove disobedient stems when they start reaching away from their designated fence or trellis. Remove any dead flowers that are still attached to your jasmine. 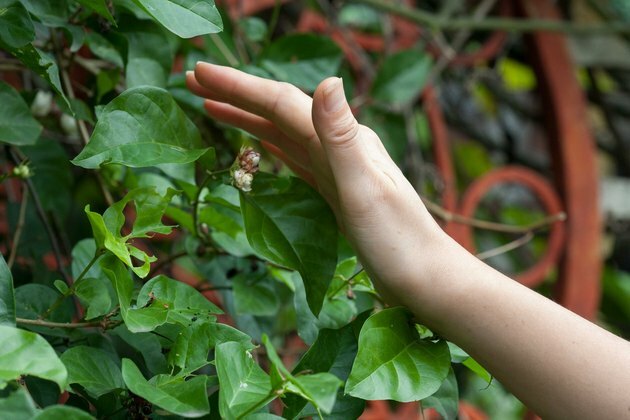 Flowers should come off easily if you run your hand along the plant's surface. Hard prune your jasmine if it becomes too large or unmanageable and if you want to start from scratch. 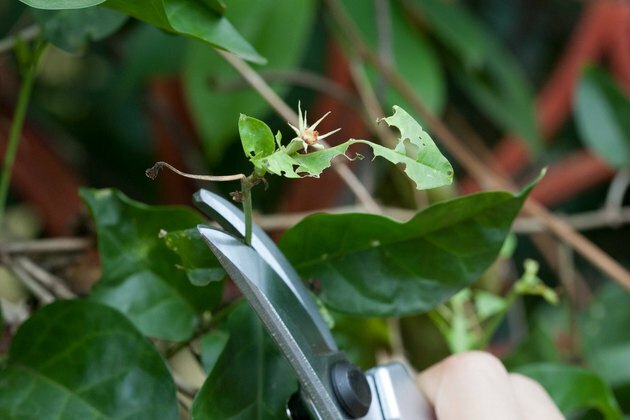 Hard pruning involves cutting back every stem within 2 feet of the ground, leaving a collection of small flowerless stems. 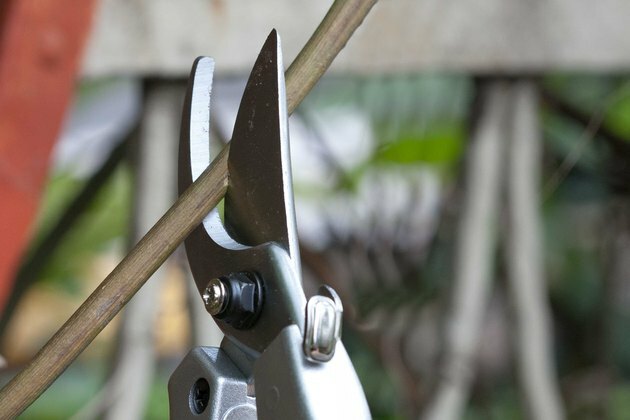 Both types of jasmine will tolerate this technique, but be ready to train new shoots because your jasmine will grow vigorously after a hard pruning. It will take two to three years for your jasmine to bloom again.